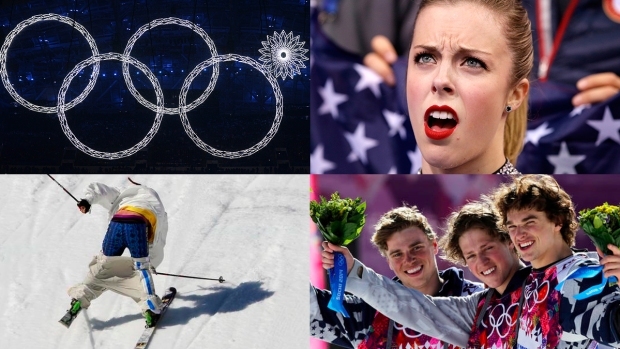 Quiz: How Well Do You Remember the 2014 Winter Games? The Olympic torch will soon journey to Pyeongchang, South Korea, to kick start the 2018 Winter Olympics. Top athletes from around the world will vie for a cherished gold medal in 15 different winter sports when the competition starts Feb. 8. As sports fans gear up for the Winter Olympics and the internet anxiously awaits what new memes will surface, take a look back at some of the top Sochi social media moments from the 2014 Winter Olympics. The opening ceremony is a time for the host country to showcase its pomp and the world’s first glance at the Olympic athletes. With years of preparation and billions of dollars and resources put into its production, it’s no wonder a malfunction during the ceremony might draw attention. That's what happened during Sochi's -- a lighted snowflakes that was supposed to open into the fifth Olympic ring did not work. The stubborn snowflake became a meme, but the Russians took it in stride, making fun of it in their closing ceremony festivities. Sharpshooter T.J. Oshie made four out of six shootout goals to propel the United States to victory over Russia in an opening round hockey match that eliminated the hosts. The U.S. mens team still left Sochi without a medal, but Oshie's epic performance brought him plenty of fame on social media. Within an hour of the game ending, T-shirts saying "Oshie Owns Sochi" were for sale online. Journalists and athletes used their social media accounts to document their Olympics experiences, but shortly after the Sochi Games started, #SochiFail started to appear on timelines. The run-up to the Olympics featured report after report of shoddy or partially completed construction, and sure enough, some infrastructure wasn't ready for showtime. Brown water and broken elevators were among the problems that helped propel the daily musings also posted as #SochiProblems. Legendary sportscaster Bob Costas was sidelined from live television coverage for five days due to an eye infection. "My apologies to everyone for the unavoidable but uncomfortable circumstance of a broadcaster's ill-timed affliction getting in the way, even for just a moment, from what we all came here for," Costas said. Former Olympic skaters Tara Lipinski and Johnny Weir are well known for their fashion and commentary as analysts for NBC Sports. From donning a fur coat to tiny shorts, Weir's breakthrough Sochi fashion moment was arguably a hot pink tailored jacket. He’s perfected sporty fashion and slays on his social media timeline, too. Figure skater Ashely Wagner joined the likes of gymnast McKayla Maroney with her "unimpressed" #wagnerface. After finishing her figure skating short routine in Sochi, she looked up to the board and reacted to her score — 63.10 — with surprise written all over her face. The internet loved it. Some Olympians brought awareness to Russia’s stray dog problem as they opened their hearts and homes to man's best friend. United States slopestyle skier Gus Kenworthy shared moments he spent with five stray pups he found at the Gorki Press Center. He announced he was going to adopt the puppies on social media. Snowboarder Lindsey Jacobellis joined Kenworthy and also adopted a dog. BBC reporter Steve Rosenberg used the bathroom at the cross-country skiing and biathlon center and found one stall and two toilets. He snapped a photo and posted it to Twitter, resulting in others sharing similar "twinning toilets" around the globe. Adrenaline and satisfaction exuded from speedster Olga Graf after she won the first medal for Russia in the women’s 3,000-meter at Sochi. She celebrated during her warm-down lap by unzipping her racing suit. Shortly thereafter she realized she had nothing underneath her suit and zipped it back up. The internet went wild and praised her for her free spirit. Quinn had a second chance at internet fame when he found himself stuck again — this time in an elevator. He was left with no choice to pry the doors open. The internet agreed his heroics deserved their own hashtag and #Quinning was born.